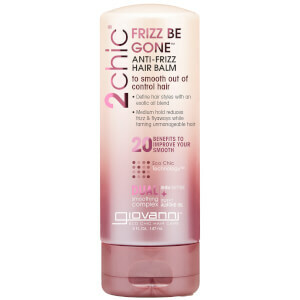 Create defined, polished curls with Giovanni 2chic Frizz Be Gone Taming Cream; a lightweight, non-greasy formula to tame, condition and improve hair's manageability. Utilising Shea Butter and Macadamia, Argan, Moringa and Sweet Almond Oils, the luxurious cream can be applied to damp or dry hair for superior softness and frizz protection. Hair feels smooth, calm and deeply moisturised from root to tip. Distribute on damp or dry hair, Style as desired for frizz-free, soft and beautiful tresses. Aqua (Purified Water), Dimethicone, Caprylic/ Capric Triglyceride, Isopropyl Palmitate, Glyceryl Stearate, Cetyl Alcohol, Glycerin, Butyrospermum Parkii (Shea) Butter Extract, Prunus Amygdalus Dulcis (Sweet Almond) Oil, *Macadamia Ternifolia Seed Oil, *Argania Spinosa Kernel Oil, *Adansonia Digitata (Baobab) Seed Oil, *Moringa Oleifera Seed Oil, *Simmondsia Chinensis (Jojoba) Seed Oil, *Cocos Nucifera (Coconut) Oil, Fragrance, Glyceryl Stearate SE, Polysorbate 60, Propanediol, Carbomer, Phenoxyethanol, Ethylhexylglycerin.